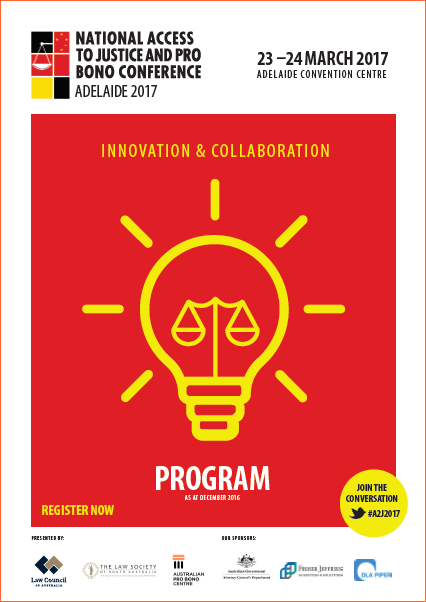 Registration is now open for the Sixth National Access to Justice and Pro Bono Conference to be held in Adelaide on Thursday 23 and Friday 24 March 2017. The program provides an exciting range of speakers. The key note address will be given by Sheldon Krantz, the author of the book What’s Wrong with the Legal Profession and How to Fix It, talking with Nicolas Patrick, global pro bono partner at DLA Piper. The conference program includes two sessions on innovation and technology, and covers topics from the use of preventative work to increase access to justice through to mental health and how to best support your clients and look after yourself. Amanda Alford, the dynamic director of Policy and Advocacy at the the National Association of Community Legal Centres will talk about Funding Equal Justice: the Funding Challenges and Opportunities for the Legal Assistance Sector. As usual, this conference provides a great opportunity for networking, with delegates attending from across Australia and across the legal assistance sector and the legal profession. Held for the first time in Adelaide, the conference provides an opportunity for as many of us as possible to attend and show our support for the lawyers of South Australia who, in the current funding climate, face significant challenges to improving access to justice in their community. A number of the members from the judiciary and the bar from South Australia are speaking at the conference. The final plenary session for the conference features Senator the Hon George Brandis QC, Attorney-General and The Hon. Mark Dreyfus QC, Shadow Attorney-General addressing the topic of The State of the Legal Assistance Sector – What is Justice Today and Where to From Here? The conference website and program can be seen online here. Sponsorship opportunities still exist and you are encouraged to contact the Centre or the Law Society of South Australia, particularly if you can help to pay the fares and accommodation costs for some of the community sector speakers. Early bird registration closes on 21 January 2017 so REGISTER NOW!